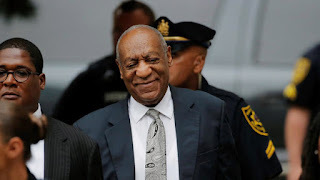 I know Bill Cosby is happy after a Pennsylvania judge declared a mistrial Saturday in the case against Bill Cosby after a jury was unable to come to a unanimous decision. Bill Cosby's legal team made the right call not to have the comedian take the witness stand during his sexual assault trial. Camille Cosby accuses the judge of 'overtly and arrogantly collaborating with the DA'. Camille Cosby releases statement after Bill's mistrial declaration. Cosby's greatest television success came in September 1984 with the debut of The Cosby Show. Cosby showed no immediate reaction. After the mistrial was declared, he stood up and seemed to be distressed as he spoke to his spokesman. Jurors in Bill Cosby's assault trial said they are deadlocked and cannot come to a unanimous consensus on any of the charges against the comedian.